Armed with the negative reviews from Yelp, we proceeded with caution. Upon sitting down in the restaurant, I noticed that one of my cardinal rules were violated. (Rule #12 – Only eat in Mexican restaurants that display a crucifix and a likeness of “our Lady of Guadalupe”, though rule #13 (silverware shouldn’t match) is also good to observe in Mexican restaurants as well.) So we ordered with caution. “What would be hard to screw up?” My clever fiancee asked me. I looked back at her. We immediately decided on passing on the Fajitas. Instead, I opted for the cheese enchiladas and she opted for 3 ground beef tacos, which she asked for soft rather than hard. We also got 2 $2.00 margaritas. At first, I didn’t taste any booze (there wasn’t much) but I felt a bit of a kick later. We then enjoyed the complimentary chips and salsa. They actually serve you both freshly made pico and salsa. The salsa is underwhelming. I’d skip it. However, the pico was quite good, and reminded us of Chuy’s back in Dallas. 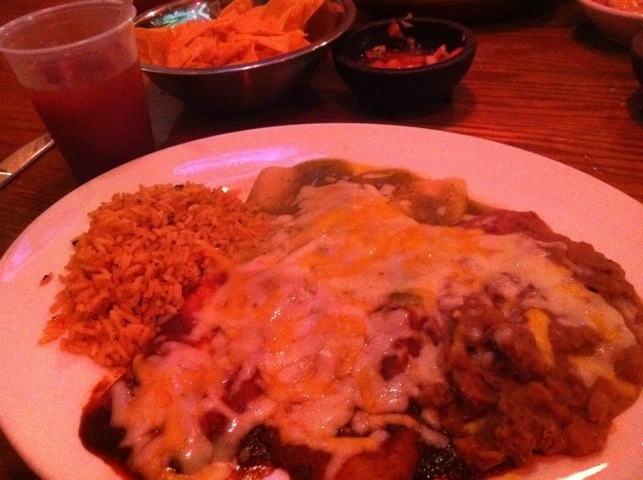 And we love us some Chuy’s. The service was slow (especially since we were the only ones in the restaurant–we were there later than lunch diners usually eat), but not unresponsive. When our food came out, it was warm. Alicia’s tacos were good, but I think I made the better decision. The enchiladas weren’t bad–they came with like a ranchero green sauce on one half of eacn enchilada, and almost a plum sauce (think: mole sauce) on the other side. The beans were okay, but I was pretty hungry. I didn’t like the rice (though I don’t usually eat my rice anyhow.) Putting the pico (bite by bite) on my enchiladas provided an extra “kick” and further improved the dish. Anyhow, could have been much worse, though I would recommend going to a Tickets 4 Tonight counter and paying $2.00 to get half off your check prior to dining here. Posted on September 20, 2011, in Hotel Food, Lunch, Mexican / Tex-Mex, Positive, Year of Food and tagged Casino Food, Las Vegas, Nevada. Bookmark the permalink. Leave a Comment.